Exe Windows Doors and Conservatories offer Triple Glazing in Devon. If you are looking for windows with a lower U-value, safety and security and looking to reduce noise these may be what you are looking for. Changing from single glazed to triple glazed makes a huge difference on your energy bills whilst improving the security of your home and reducing outside noise. Living on a main road or busy street can be quite noisy day and night so triple glazing would be ideal for that situation too. 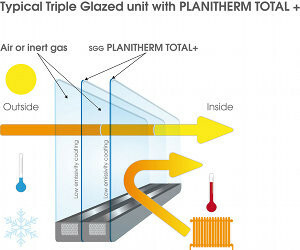 If you have any questions about triple glazing please feel free to ask. We can help you decide whether it is the right choice for you and your property.